Purpose: Use this document as a reference for enrolling staff into Spending Accounts in ctcLink. This is particularly helpful for employees that do not work standard year round jobs. This customization was introduced by SBCTC when it was noted that an annual pledge on its own only takes into account a standard number of pay periods in a year not the number of pay periods indicated in the Job Data frequency. This led to underpaying towards the Annual Pledge early in the year until a final pay period in which a large balance would try to be collected by the system. This customization will prevent this situation. Override will still be halted when the Annual Pledge is met. 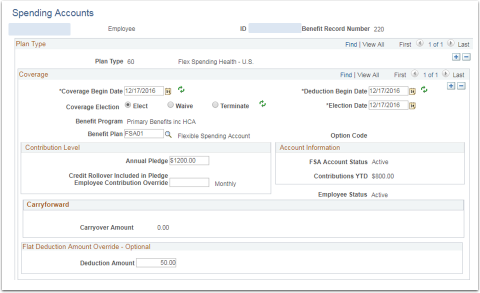 Override must be calculated with Annual Pledge, and number of pay periods the employee will experience taken into account. Account Information is a box that will always give you current YTD activity on this item. This is a derived value on the page, which means it cannot be queried. To arrive at a similar number, deductions through Payroll would need to be referenced. No other entry is needed on this page.